The Windsor New Norfolk shed is ideal for those looking for a bargain. Whilst it comes with high quality Shiplap tongue and groove cladding to the walls, it is still classed as one of the more entry-level buildings available. That doesn’t mean that it doesn’t come with a few great features however. 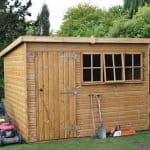 If you want to see the top 6×4 sheds for sale is the UK right now why not check out the What Shed winners of the top 6×4 shed awards. The apex roof offers both great interior head space and excellent water resistance. 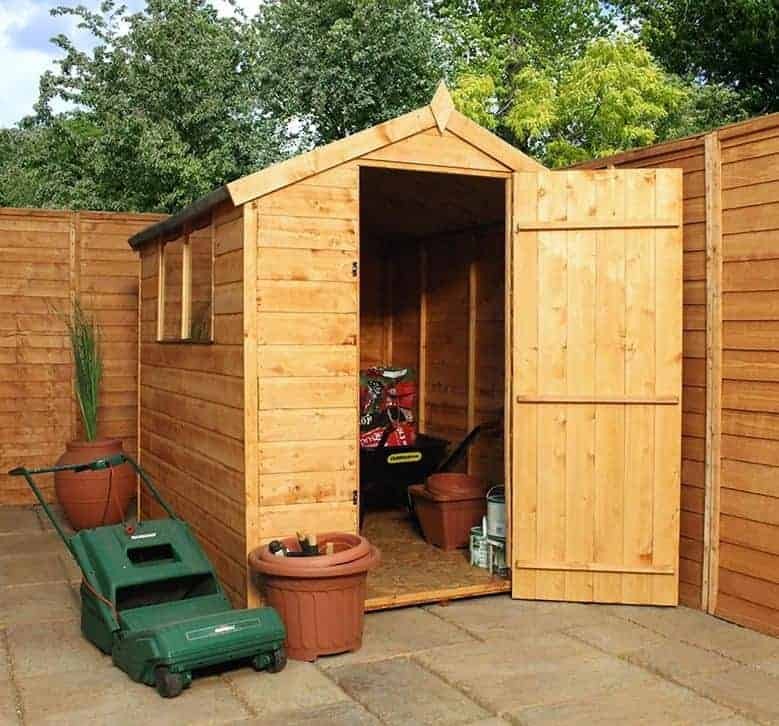 It is one of the taller sheds available and makes it easy to store particularly large items such as gardening rakes and fishing poles. Two fixed styrene glazed windows ensure throughout the day you can see exactly what you’re looking for inside the shed. They also benefit from being completely shatterproof. You can opt to install them on either side of the building thanks to its interchangeable panels. Solid sheet materials are used inside the building which offer medium strength support. This means the shed is largely suitable for light or mid-weight storage. A single door opens up pretty wide to offer convenient and easy access. It is also pad-lockable, though you are not supplied with an actual padlock. 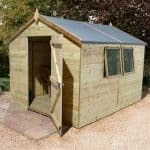 This is one of the cheapest sheds offered by the Shed Store and it provides no-frills storage. If value is the main thing you’re looking for, this is definitely recommended. This shed has been created with budget in mind, therefore its quality isn’t impeccable. 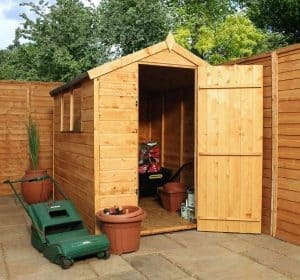 However, if you only require a basic, budget shed then this is a great option. Roofing felt supplied isn’t overly strong so could become damaged in harsh weather. We’d therefore recommend upgrading. 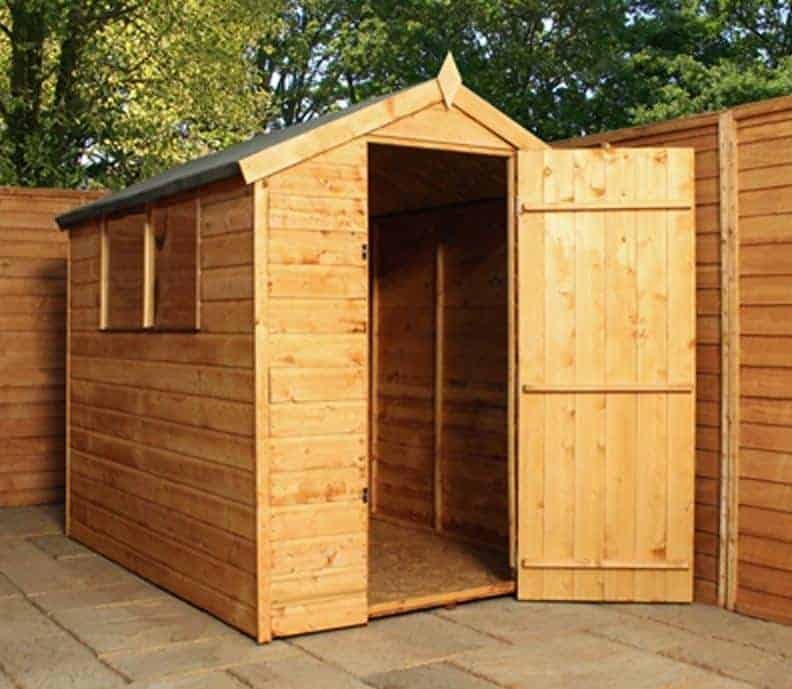 This is a very traditional looking wooden storage shed, complete with a tall apex roof. Whilst technically large enough to be used as a workshop, we wouldn’t recommend this due to the weakness of the floor. However, it offers a lot of space to store anything from light garden mowers to bicycles and other essential gardening tools. The door width is one of the most noteworthy measurements on this shed. It is wider than the average door which means you have more space to manoeuvre in and out. Storing bulky items won’t be a problem, though you may find you do need to duck to enter. At 5’5”, the height of the door won’t be an issue for many people, but if you’re slightly taller you may find it a bit of an inconvenience. This is a fairly deep shed too so you will need to make sure you have enough depth in your garden to accommodate it. Like so many sheds these days, this one has an apex style roof. This tends to be a favourite with manufacturers because not only does it offer great water resistance, but it also gives the inside of the building a lot more height than other roof types. There is no chance rain can build up, as it runs diagonally downwards and straight onto the ground. A light roof felt is included too, though you might want to upgrade this. It’s similar in quality to the felt that comes with most sheds and will provide good protection for around one year. After that though it is likely to start deteriorating so upgrading to a higher quality felt in the beginning could save you time and hassle further down the line. 8mm solid sheet material is used for the roof. This is reliable, but not as sturdy as tongue and groove. As the roof is made from solid sheet materials, it’s not surprising to see the floor is also constructed from solid sheet board. However, it does come at a slightly thicker 10mm. Shed Store seem to provide this solid sheet floor with the majority of their buildings. It’s great for light storage, but we do question just how well it would withstand the weight of heavier equipment. Therefore we’d recommend this for light to medium storage only. However, it does benefit from strong pressure treated floor joists so this does improve its quality compared to standard solid sheet floors. This New Norfolk shed is designed with super quality Shiplap tongue and groove cladding. It offers a much higher amount of protection against the weather and is extremely thick in comparison to overlap. It is also unlikely to warp, though there is an expansion gap built in just to ensure if it does it won’t cause any damage to the structure and stability of the shed. Whilst it is always nice to see Shiplap cladding used on outdoor buildings, this one does have a slightly different appearance to most. As you will see from the picture, the colouring of the timber is a little mismatched. Typically with Shiplap cladding you find it has a flawless, stylish design. The slightly different colours give it more of a rustic look, similar to overlap. However, despite this small design flaw it still provides a thicker, more durable design than overlap cladding. Tongue and groove style construction is also a lot easier to put together. This is thanks to the way the panels simply slot into one another. Once connected, they also have a great interlocking design which protects the interior of the shed from drafts, as well as offering a good level of water resistance. Something you can’t see from the picture is the unique channel that is included on each panel. This is a benefit of Shiplap and it literally channels the water away from the wood, protecting it from rot. We were confused with the frame size. In the specifications it states standard 28mm x 28mm framing is used, but the product description states that 27mm x 34mm framing is used. So which one is right? Well it appears it does actually have the slightly thicker framing so this is an advantage as it offers much more stability. One of the great benefits of Shiplap tongue and groove cladding is that it can usually be treated every other year providing you use a high quality preservative. However, the manufacturer does recommend treating the shed annually. It is provided with a free basecoat treatment before being shipped, but this simply provides a light coating to protect it whilst being shipped. So it’s advisable to treat the building again once you have erected it. Shed Store do offer great water based treatments that you can use to not only protect the shed, but also add a more stylish, coloured finish. These types of treatments add a weatherproof barrier on the surface of the walls and they do need to be reapplied every year. Another option and one we would recommend, is a spirit based treatment. These offer a higher quality protection, forming an internal barrier as they penetrate into the timber. They also provide a surface barrier just like the water treatments. However, the fact they form such a deeper barrier means you don’t have to reapply them annually. Instead you can treat the shed every two years. A 10 year warranty against decay and rot is provided, though you will need to ensure you maintain adequate treatments. A single ledge door with a slightly wider than average design is included on this shed. It provides quick and easy access into the building, enabling you to store large, bulky tools and gardening equipment. It is hinged for extra stability and you can padlock it, though a padlock isn’t actually provided. The fact it isn’t braced is a little surprising as tongue and groove style sheds typically feature a stronger door design. Bracing really helps to protect the door from sagging which can occur through frequent use. So its quality compared to some competitor sheds isn’t quite as good. Of course, you can brace it yourself but this would be extra work and if your DIY skills aren’t very good it could prove difficult. Two styrene glazed windows are supplied and you can assemble them on the left or the right hand side of the shed. Styrene is often considered better quality than single glazing because it is shatterproof and tougher to break. The windows don’t open so they won’t supply any fresh air into the building, but they do offer light throughout the day. 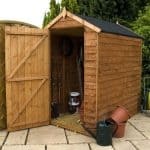 Like many of the sheds provided by Shed Store, this doesn’t have much in the way of security features. You can padlock the doors, though as mentioned above, a padlock isn’t actually supplied. One thing which does increase security is the tongue and groove Shiplap walls. They offer a very solid design which is practically thief proof. The two fixed windows included on the shed are also pretty big. This means it isn’t difficult to see what’s inside. The good thing about the thicker cladding however, is that you can add a covering to the windows such as blinds, curtains or even netting. That way, you can open them whilst you are using the shed and keep them closed when you’re not around. The only way to truly customise this shed is to add colour to its walls. Shed Store give you the opportunity to do this with coloured treatments. Whilst they are water based, they will still provide a great amount of protection thanks to the naturally strong cladding used to create the building. You can choose from four different colours including Dark and Light brown, Ivy Green and Cedar Red. All of these treatments come in 5L tubs and they can be applied via a brush or a paint sprayer. What’s more, they have been created to be 100% safe to be used around pets and plants. You also have a choice of a unique range of extras available with this shed. If you aren’t great at DIY, the installation service is an excellent extra to invest in. Professionals will assemble the shed for you, eliminating any stress and also the time it would take to build it yourself. Keep in mind that this installation service does not include the assembly of a base kit. 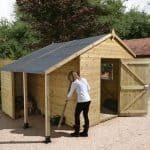 A Portabase DIY Timber Base Kit is available and this is something we would recommend if you don’t have a concrete base to erect the shed onto. It isn’t cheap, but the extra money spent on this base will pay off in the long term as it really adds to the stability of the building. It has been pressure treated to last at least 10 years and you don’t need any experience or tools to install it. However, if you’d rather not spend time building this either, there is a separate base installation service available. However, due to how simple the base is to put together, we’d advise against using the professional service due to its high cost. Finally there is a DIY Assembly Assistance Tool Kit available. Now this is actually very useful and a great investment as it can be used for any other buildings you purchase in the future. It consists of various tools including a 16 inch saw, brushes for painting and adding treatments, goggles and safety gloves and a hammer. It’s pretty unusual for us to give a Shiplap tongue and groove clad shed such a low rating. However, compared to similar competitor sheds this isn’t as strong or as durable. It has largely been built as an entry-level building and this is reflected in the low cost. It still provides good value for money for the price you pay, but it isn’t the highest quality Shiplap shed on the market. The overall durability of the materials is pretty good. 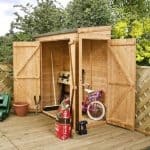 However, you do need to take into consideration the treatments that are required to keep the shed protected against all weathers. The interior of the building is also built with solid sheet materials which aren’t as strong as tongue and groove. The interior space is generous and allows you to store a wide variety of equipment. You could even keep your family’s bicycles in here, along with any light or medium weight equipment. Shelving can be attached to the walls too so this gives you the chance to add extra space for your gardening bits and bobs. One of the benefits of this shed is its ease of installation. You should find it is fairly quick to assemble considering its size. Rough estimation time is from 3-5 hours. The instructions are pretty basic but still easy to follow. Value for money is the main feature of this shed. It is suitable for all budgets and doesn’t require too much money to be spent on extras. It will require annual treatments unless you use a slightly more expensive spirit treatment. However, all in all it is a great value storage shed. Final Thoughts: We’d consider this an entry-level shed, though it is enhanced by the tough Shiplap cladding exterior. Inside you’ll find solid sheet materials used for the floor and roof. These provide sufficient strength for light or medium weight tools and equipment. So it would best suit those looking for a simplistic place to store their light gardening essentials. The two fixed styrene glazed windows are one of the benefits of the shed, offering great lighting inside the building during the day. We also like that they can be installed on either side of the building. 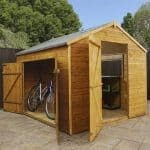 Overall we’d recommend this shed to anyone looking for a low cost, long lasting storage space.